Join us on Friday, March 9 from 5:30-7:00 pm as we celebrate the opening of the Stonewall Gallery’s newest show featuring recent work by Yarmouth artist Leslie Hamren. Wine, cheese, and light refreshments will be served at this free opening reception. Originally from Sewickley, Pennsylvania and a graduate of Denison University, Hamren has been a resident of Maine for the past 35 years. 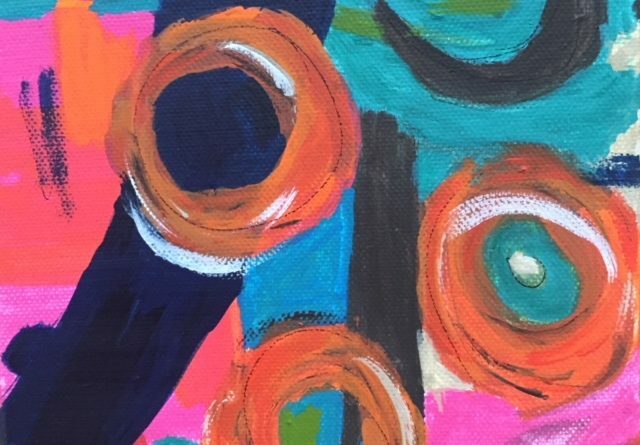 She remarks: “Art has always been a part of my life – whether creating pieces influenced by nature at a young age, batik classes while living in London, painting primitive scenes from travel photos, or developing my not-so-abstract abstracts. A no-fuss approach dictates the results – thinking about anything too much can ruin the mood!” She has previously shown work around Yarmouth, including shows at 317 Main Community Music Center, the Yarmouth Arts Festival, Clayton’s Café, and Maple’s. Abstraction by Leslie Hamren will be on view at the Stonewall Gallery through April 28, 2018. The Gallery is located inside the Yarmouth History Center at 118 East Elm Street and is open Tuesday through Saturday from 10-5.